Note from racketboy: I had to share this enthusiastic review from Mozgus. He has been one of the biggest contributers to the site’s community and I know from experience that if he likes a product a lot, than it must be worth mentioning. I also agree with his standing that the GBA is still an excellent piece of hardware for retro gamers — especially if you are on a budget. I hope you find this review useful. I consider the Gameboy Advance SP an absolute must-buy for anyone who appreciates retro-gaming, but sometimes wishes that those games had a bit more polish or new-age refinement. I have so many great things to say about the platform. The price is very reasonable. The back-light screen is gorgeous indoors. The battery is rechargeable. The unit itself is extremely portable. The screen is well protected when folded up. The library of games are fantastic (and cheap). It just plain looks stylish. It also has many advantages over the regular GBA and the GB Micro. The consumers seem to realize this, since the SP still sells better than the other two, in both Japan as USA. That being said, I have very few gripes. One complaint involves the battery only lasting 7-8 hours per charge. The second issue is that the unit itself isn’t very comfortable to play for very long. This brings me to the point of this article. These two issues have been quite resolved with the purchase of a product known as the Pelican 3X Battery. This little baby has officially bumped the GBA SP into place as my all time favorite handheld. At $2 plus $7 shipping on eBay, I feel this has been one of the best buys I’ve ever made. 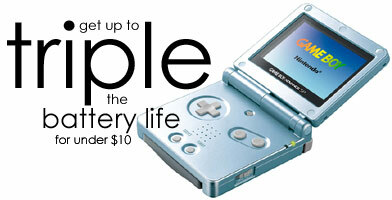 The main objective of the item is obviously to raise your SP’s battery lifespan. And boy, does it ever. Instead of 7-8 hours per charge, I’m getting 20-22 hours, no joke. Know that the newer SP with the backlight screen actually uses up power about 40% faster when using high brightness. If I had to estimate, I probably spend 3/4ths of my game time on low brightness, with medium volume, and 1/4th of my time on high brightness with high volume. So figure that in however you wish. The average charge up time requires about 3 hours now, whereas it used to require about 90 minutes. Very reasonable. This life-span is far beyond what I had expected after reading the battery’s specs, which are 3.7V at 1000mAH. My SP’s stock battery reads 3.8V at 600mAH. One would assume that the Pelican battery wouldn’t actually reach the advertised 3X mark, but somehow it does. Regarding comfort, this is what I consider an unintentional bonus. Those who own SPs would probably agree that after an hour or so, your hands start to hurt. This is most likely due to how thin the SP’s control deck is. The battery actually adds much needed thickness to the unit. It’s amazing how much 1/5th of an inch can do. It also provides nice little ridges close to the sides for your fingers to rest on. I’ve played games on here for close to 3 hours strait and my hands feel fine now. I can’t leave this entirely positive, as that’s just not my style. If I really had to find any fault at all, I suppose one could argue that the battery could have used a superior means of installation. It relies on the same singular screw hole which your old battery’s cover plate uses. This battery’s plate is obviously external now, and it could be possible to get the cloth of your pants’ pocket flap snagged on the plate, and possibly do damage. That’s definitely a “what if” scenario, however. So if you own an SP, you should really look into getting one of these. It should be at the top of your priority list of accessories, even before the headphone jack and USB charger cable. 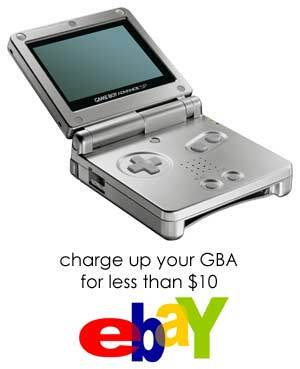 If you don’t own an SP, but are in the market for a handheld of some sort, I advise you not to overlook the GBA SP just because it’s from the previous generation. Those newer handhelds sure do seem enticing, but the GBA SP is a much safer buy, especially if your gaming tastes are in tune with what our little community seems to be configured to. And of course, the SP still plays old Gameboy titles, a feature which the Micro and DS lack. Note: I am in no way benefiting from this article. I’m honestly spreading the word on a great item which I myself was unable to find a review for prior to the purchase. I simply decided to take a small chance and was very surprised by the results. Another note from racketboy: If you have product that you are passionate about that would be beneficial to retro gamers, please let me know and I’ll see if we can work on publishing a review. Thanks again to Mozgus! One little note. 2 nights ago I tried to turn on the SP and nothing happened. It was pretty strange, but by simply flipping the power off and then on once more it was fine. I’m not sure if the battery was to blame for this, but if it gets worse, I’ll speak out. The battery may have just been knocked out of place slightly. As long as it doesn’t mysteriously shut off in mid-play, I have no major issue. I really enjoy your website, keep up the good work. What kind of flash cart do you have there? What? No one would actually buy Doom? It’s a good port. Doom 2 on the other hand was a terrible port. I was just playing Doom on my Supercard MiniSD. I just don’t like the load times and having to back up the saves on the SD card via the main menu. You know, I was wondering why there were no reviews for this product. I’m guessing the reason is because it was released at the end of the SP’s “lifespan”. It probably wasn’t selling very well either, since the product is now discontinued. However, at the time I bought the 3x battery(a few weeks ago for the purpose of a long plane journey from North America to Asia on which I will be embarking soon), I was a little doubtful as to the quality of the product. So thanks a bunch for the review!